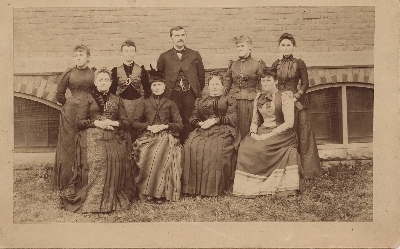 Nonotuck Street School Faculty: (standing) Hattie Stearns, Margaret Griffin, John A. Callahan, Lucy Ramage, Catherine Griffin. (sitting) Mrs. S. J. Todd, Emma Swindt, Abby Nash, Johanna Reardon. "Nonotuck Street School," in Creating Holyoke, Item #255, http://creatingholyoke.org/items/show/255 (accessed April 18, 2019).